Yesterday I had the opportunity to experience the lovely Patina Market in downtown Pleasant Grove. It is a darling little shop full of all of your Etsy favorites. I can't tell you how nice it is to see so many lovelies in the same place. The artists featured change each week so the selection is always fresh. In addition, the owner, Nichole, is informative, friendly, and awfully talented herself. You must check out her kimono belts...they are gorgeous! 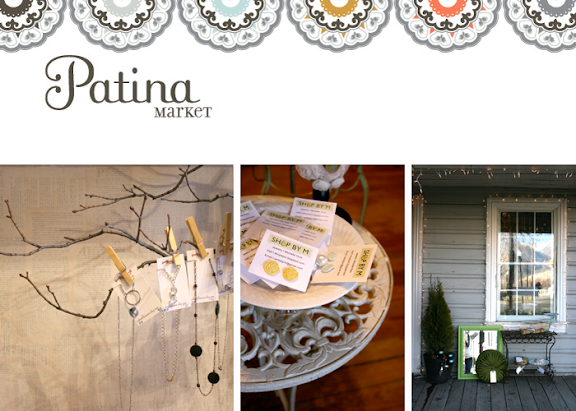 Patina Market is open Wednesday - Saturday from 11 a.m. until 7. Catch the market on your lunch break or just after work. Hey those are my earrings in the middle picture! Isn't it a charming little shop. Glad you were able to visit it. I love Nichole's idea for Patina! How fun to have an ever changing shop with handmade things. I'm excited to start being a part of it after Christmas! And Nichole is so sweet, I hope that her beautiful shop does well, it is just the cutest. Sounds like my kind of place! I'll have to visit Patina Market the next time I'm in Utah. Patina is the cutest little shop! It's the perfect spot to find those one of a kind-unique gifts that all will just adore. Also the right place to pick up something special for yourself. I heart patina. I sell my jewelry there! It is awesome, you should go.